Made of homespun rosewood timber from the streets of Saharanpur and instilled by brass veneer, the above jeweled box could be utilized for diverse purposes. Don't limit yourself to treasure only high-prized accessories. Right from storing one's ornamental pieces to gifting it to your beloved ones, the jewelry case can come handy and can be used for other creative ideas. Due to its light weight and motile nature, you could also carry it as a travelling kit. 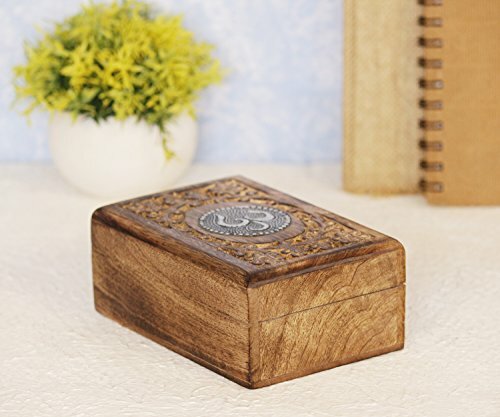 Why not try using it as an enchanting keepsake box where you could cherish love letters and reminiscing old memories? Handmade by skilled artisans from Saharanpur - India's largest hub for high quality wooden artifacts. If you have any questions about this product by The StoreKing, contact us by completing and submitting the form below. If you are looking for a specif part number, please include it with your message.